​TEXAS – A map had been circulating online that noted the average salaries of millennials in each state. Because the state-to-state differences were pretty minor, JLL decided to investigate further and look into what this really meant to working millennials in major metro areas. The initial results showed the obvious —that average incomes vary widely, with certain parts of the country boasting incomes that are, in some cases, dramatically higher than the averages. For example, in Dallas-Fort Worth the average millennial income is $69,000 versus $70,000 for Portland. This compares to almost $99,000 in the Bay Area. As JLL look more broadly at their findings, the Texas markets come out on top—simply due to the solid incomes in the growing economies and the corresponding lower cost of living—driven mostly by housing and no personal income taxes. From a talent pipeline perspective—both talent acquisition and retention—these differences are critical in recruiting across all industries. 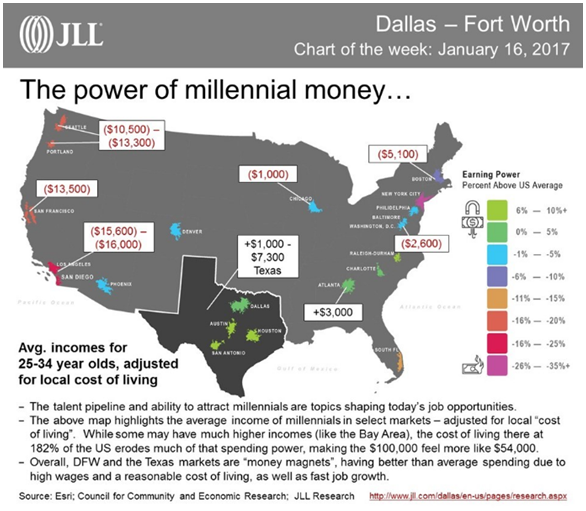 Interestingly, DFW and the other major Texas markets, can be viewed as prospective catalysts or “money magnets” for the working millennial—where diverse job opportunities are growing, career advancement is high, and above average spending power puts you ahead of the your peers in other markets. ​​Want more data? See Austin​, DFW, and Houston Demographic & Population Market Research.